I continued painting on my teapot and now I will leave it for future finish work. I look forward to start a FRESH painting. 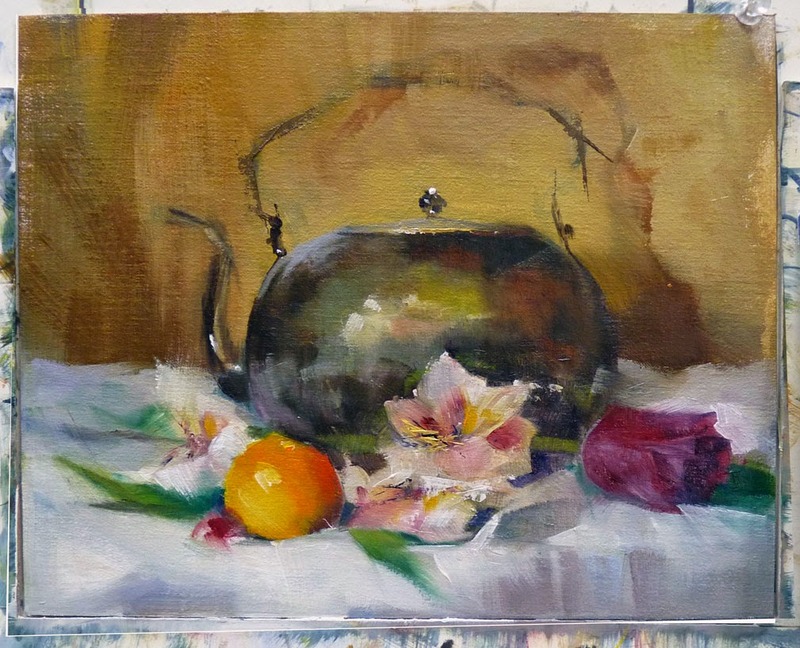 Today I'm working on painting #3 from the Qiang Huang workshop. 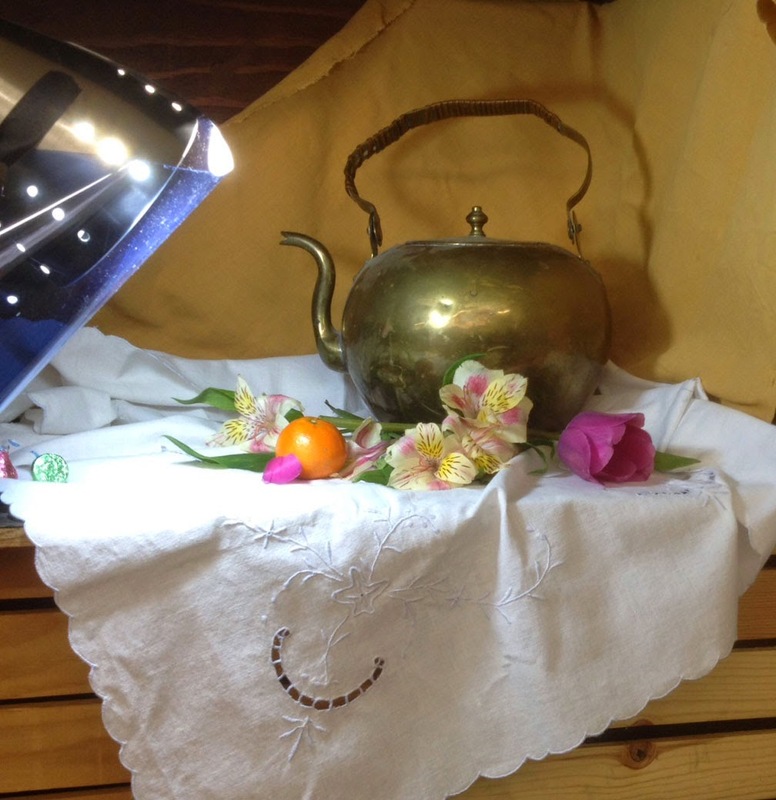 I printed a photo of my still life set up from the workshop and am painting from that reference because I don't own the teapot and the flowers have died. The lighting at the workshop wasn't great (a fluorescent bulb) and even though Qiang had me warm it up once, it was still too cool. Today I'm using a natural light bulb with blue filter overlay to simulate North light (Qiang's idea). 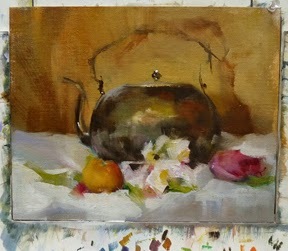 First I warm up the background, paint over most of the handle to push it back, add more warmth to the body of the teapot and simplify the linen. 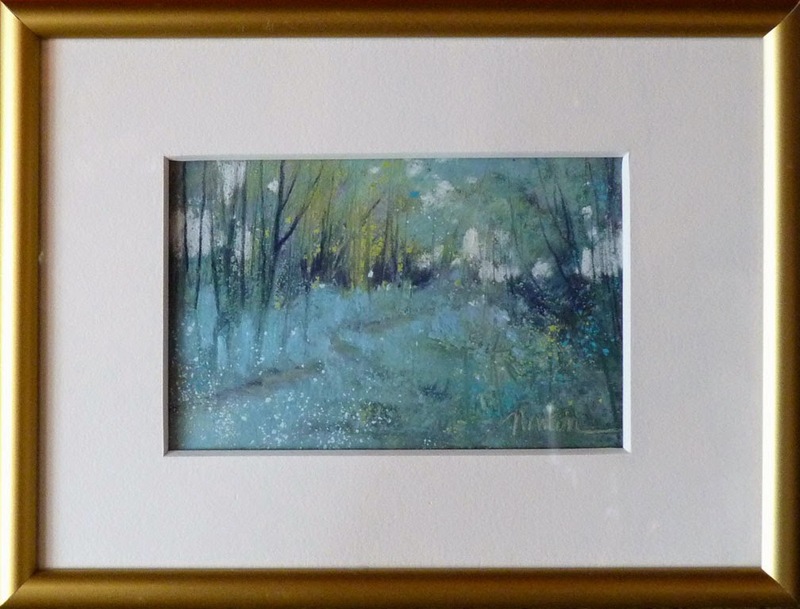 I will indicate the handle in a much more abbreviated manner than in my original painting. Working on still life objects again reminds me of when I worked as a fashion illustrator just out of art school. Being the newest artist on staff, I was the person who illustrated perfume bottles, handbags and even a sack of TurfBuilder! 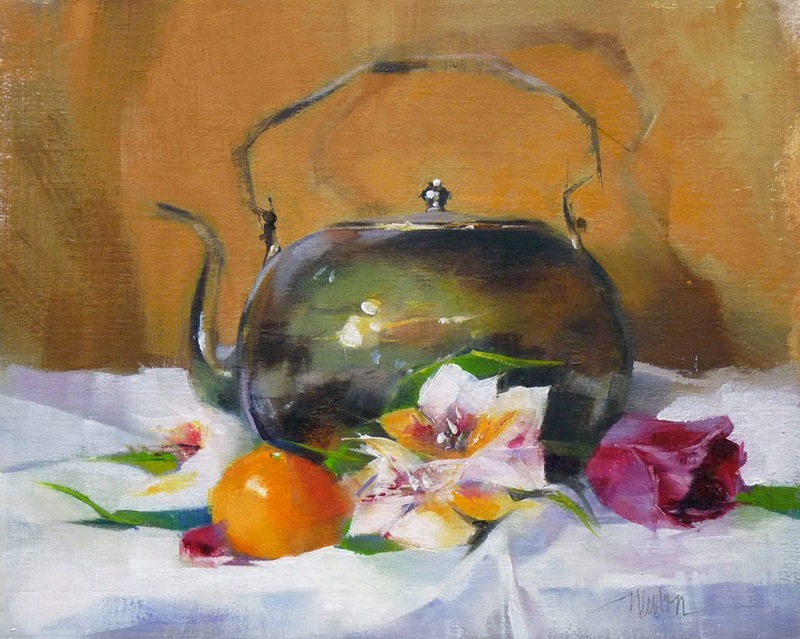 As an illustration, I would want the teapot handle to appear as much like "real life" as possible - thick and dark, which made it come forward instead of taking a supporting role to the flowers and orange which are the center of interest in this painting. I begin to define the shape of the flowers by cutting into them with a dark area of the teapot. This is as far as I could get today. I'll set it aside and think about it. Click on the image to enlarge. I'm back in my studio with lots of thoughts swirling around my brain. I feel big changes coming for me regarding my painting. I'll talk more about those changes soon on my Golden Years Blog. That blog is about the emotional journey of being an artist. 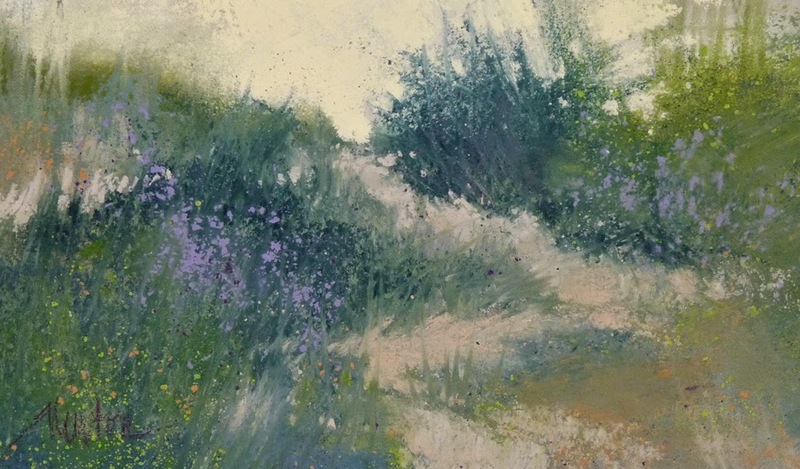 I try to keep this Art Journal blog mainly about the painting process. Above are the three unfinished paintings from the workshop: two low-key, one high-key. Per Qiang Huang's advice, I will not wipe them off - I will continue to paint on them and will post them again when I consider them finished. 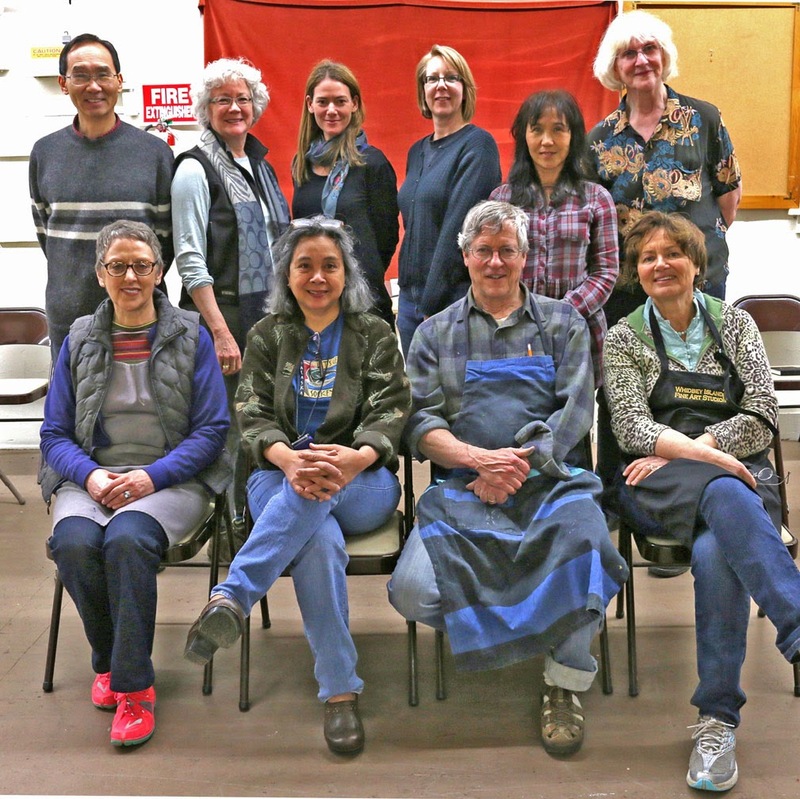 Below is the group photo of our workshop attendees, most local but one from South Africa and one from Maryland. My image in this photo (front row, in front of Qiang) amuses me. I feel I am a totally different person now than I was in my high school Art Club group shot but apparently not if body language is an indicator. Same seated pose. This is my still life set up for day three. 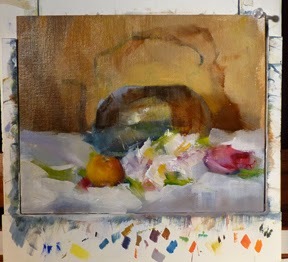 I'll continue working on this 9x12 inch painting tomorrow afternoon in the final hours of this great 4-day workshop. Qiang Huang is the most thoughtful painter I know as well as an excellent communicator, both in words and writing. Before Qiang makes a stroke on canvas, he has fully evaluated the color value, the hue, the intensity, and whether the color is transparent or opaque and then he places it exactly where he wants it. I go through times of painting by "intuition" and many times I get lucky with the result but I think it is time for me to be more thoughtful. I may be posting small (thoughtful) studies for some time to come. This is a pretty bad photo of today's effort. I am actually pleased with parts of this painting because Qiang Huang gave me very good advice at each step of the four-step process. Sadly, I discovered that my beloved Viva paper towels shed when prepping the canvas with linseed oil. 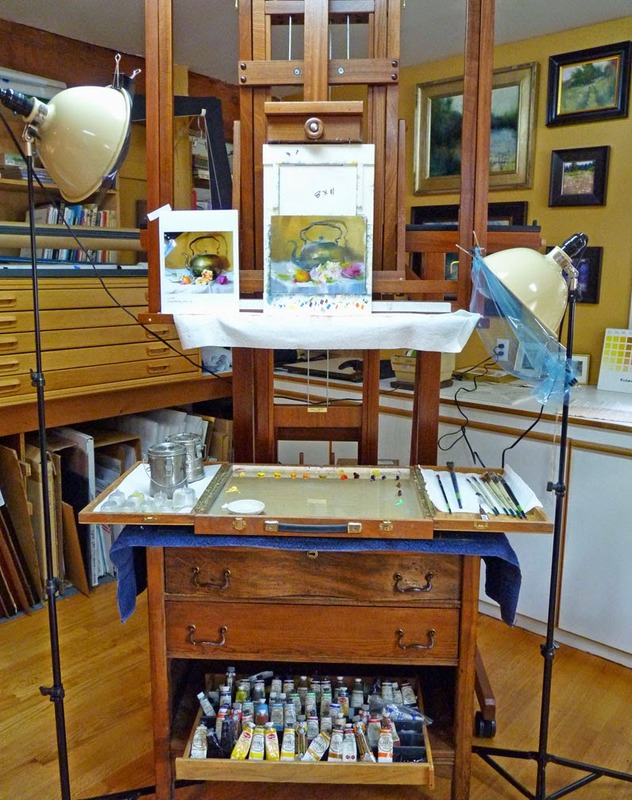 I just finished the first of four days with oil painter Qiang Huang. 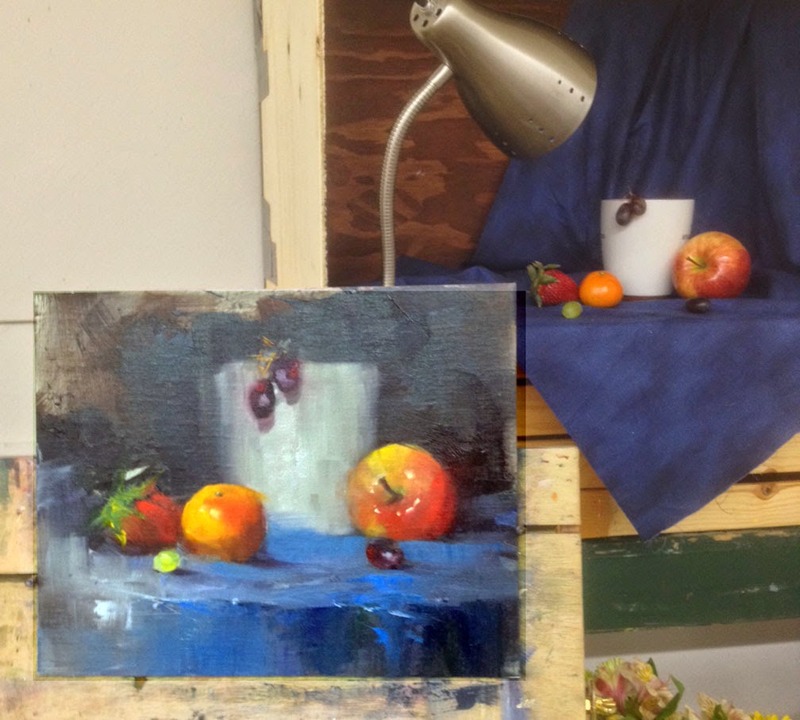 My workshop day ended with an OK apple painted in the middle of an overworked still life. My day started with my usual breakfast. I brought our Muffin Man muffins, avocado, my mocha mix, eggs and my handy little microwave egg poacher that I use at home most mornings. However, I forgot to bring a spoon. 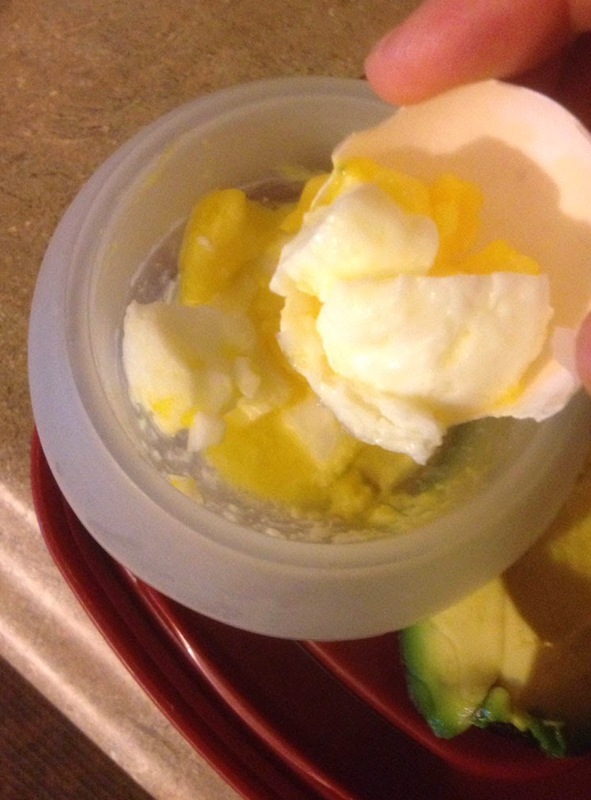 The photo above shows how to eat a poached egg using half of the egg shell as a spoon. A scene from the Washington coast. 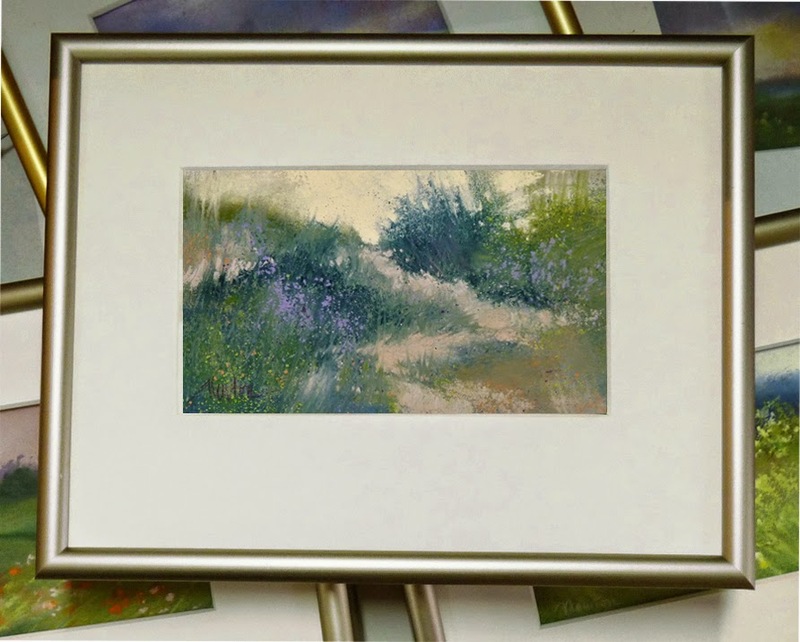 Click to enlarge or visit my gallery at Daily Paintworks to use the magnifier on this little painting. 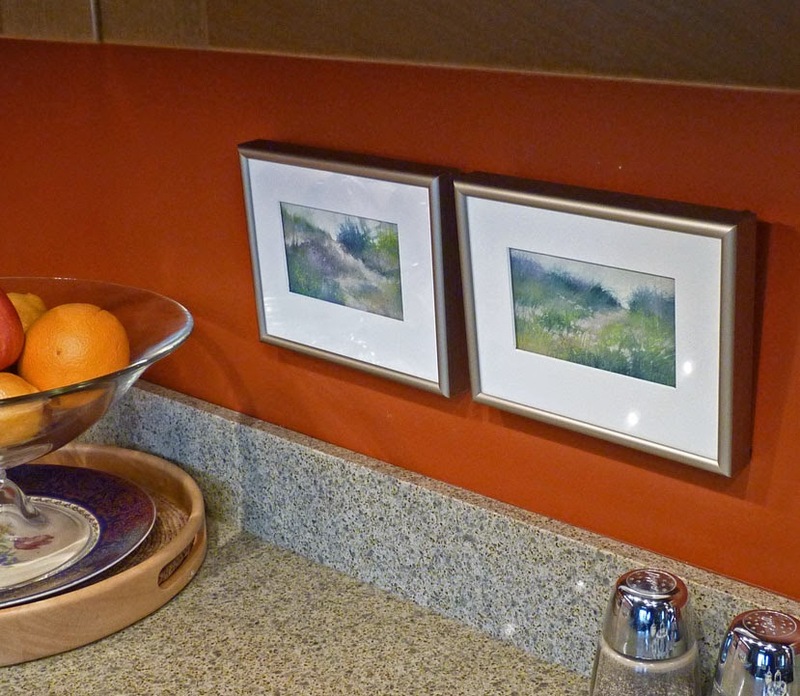 The kitchen is a good place to hang these very small paintings.